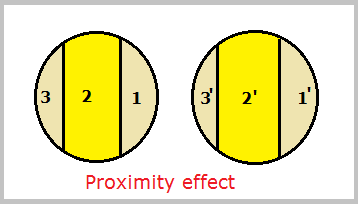 The non-uniform distribution of alternating current in a conductor due to the presence off/other current carrying conductors in the Vicinity, is called as proximity effect. The proximity effect increases the effective resistance of the conductor and is always associated with the magnetic fields of two or more conductors in the Vicinity. Consider two conductors placed in the vicinity as shown in figure. Let each conductor be divided in to three parts of equal cross—section. This form three parallel loops i.e., 1-1' 2-2' and 3-3'. The flux linking loop 1-1‘ is least and hence its inductance will be less which inturn causes higher current density at the inner edges of the conductor. Similarly the flux linking loop of 2-2‘ and 3-3' will be more and hence the inductance will be more which gives rise to lower current densities as we move towards the outer edge. This shows that the distribution of alternating current is nonuniform. The alternating current flowing through the conductor is non-uniformly distributed throughout its length. This is because the outer strands of the conductor (i.e., the strands which form the surface of the conductor) carry more current than the inner strands (i.e., the strands which are closer to the center of the conductor). This non-uniform distribution of current causes an increase in the resistance of the conductor to the flow of alternating current. This effect is known as skin effect and it shown in figure. This effect is termed because skin effect as the charges flow through the surface (skin) and not through the center of the conductor. The skin effect is absent when the current is DC this is because the direct current flowing through a conductor spreads uniformly throughout the cross—sectional area of the conductor. 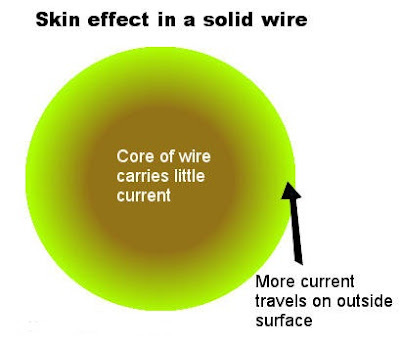 Why Skin Effect Occurs in Transmission Lines ? Consider a multi—stranded conductor composed of ‘n’ number of strand (filaments). The AC current flowing through the inner strands produce flux which links (enclose) the inner strands only. But, the flux produced by the flow of AC current through the outer strands, links (enclose) not only the outer strands but also the inner strands. Thus,,the flux linkage per ampere to the inner strands is higher than the flux linkage per ampere to the outer strands. This causes the inductance (and hence inductive reactances) of inner strands to be much higher than for the outer strands. Thus, higher the impedance lower » is the flow of current. As a result, the outer strands carry more current than the inner strands. Higher the operating frequency, the greater is the skin effect. The diameter of conductor has a direct relation with skin effect. Bigger the diameter of conductor, higher is the skin effect. The type of conductor also decides the level of skin effect. The skin effect is less incase of a stranded conductor than a solid conductor.